The shape of our quiz bird looks good for a duck of some kind. The bird is riding rather low on the surface of the water, which is characteristic of the so-called diving ducks. Dabbling ducks are more buoyant and ride higher on the surface of the water. For the sake of this discussion, the term diving duck will refer to any duck that habitually dives under water to obtain food. Moving on, the outstanding plumage feature of our candidate is the white stripe running along the side of the body. This stripe is actually formed by the white secondaries and their coverts and appears to be quite extensive. Several groups of diving ducks have white in the wings but only a few have as much white as our quiz bird, namely male eiders, Mergus mergansers, and goldeneyes. The largely grayish plumage doesn't look right for an eider, the males of which are either black and white or brownish. The body looks too compact for a Red-breasted or Common Merganser, and we can see enough of the head to tell that it lacks the shaggy crest shown by both sexes of Red-breasted Merganser and female Common Merganser. Also, female Red-breasted and Common Mergs don't have nearly as much white in the wings as our candidate, the white being limited for the most part to the secondaries of those two species. Like female mergs, female Buffleheads have white in the wings limited to the secondaries. Male Buffleheads are entirely different looking. Identifying male Common and Barrow's Goldeneyes is fairly straightforward, but identifying females of the two species is a different matter, and our candidate looks like a female. All of the popular field guides emphasize differences in bill shape and color to tell the two apart, but the bill of our quiz bird isn't visible. Returning to the wing pattern, female Commons of all ages have more white in the wing than female Barrow's, the white extending well onto the median and lesser coverts, as can be seen on our quiz bird. 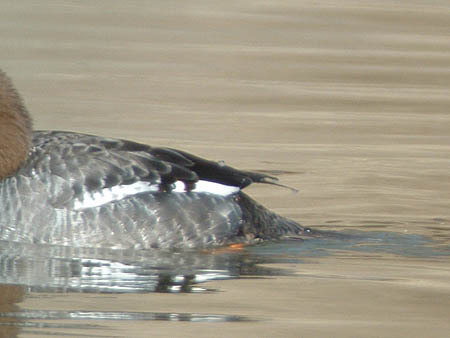 This female Common Goldeneye was photographed on February 23, 2006 at Ronan Park in Chicago.